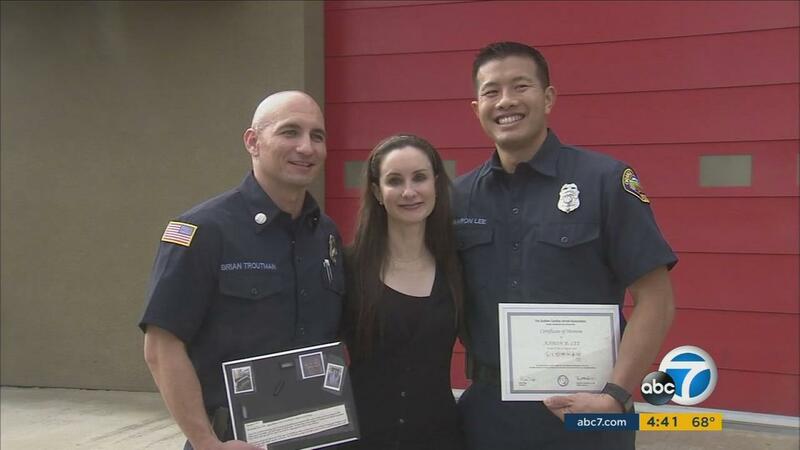 IRVINE, Calif. (KABC) -- Irvine resident Stephanie Gavshon was reunited with the Orange County Fire Authority paramedics responsible for saving her life after a sudden cardiac arrest six months ago. "It's special to see them because I don't recognize them, and I don't remember because I was unconscious," Gavshon said. Her family had just left her house, but her 13-year-old son happened to return and found her slumped over in a chair. The boy ran to get his father Clive, who called 911. Paramedics with fire engine 36 arrived shortly afterward. "There wasn't a whole lot of life left in her at that point," Capt. Brian Troutman said. Paramedics said they used an automated external defibrillator and started an IV line in her arm to administer drugs to stimulate her heart while transporting her to the hospital. According to officials, Gavshon was among nearly 8,000 cardiac-related calls answered by the OC Fire Authority last year. "It's pretty rare we get to see the results of our work," Troutman said. Though she is now back to normal, what caused Gavshon's heart to stop was not determined. "I shouldn't have survived. It really is miraculous that I'm alive," Gavshon said. "Most people who have a sudden cardiac arrest do die. Those that survive usually have significant brain damage." To say thanks, Gavshon presented certificates and hero pins from the Sudden Cardiac Arrest Association to the paramedics. She hopes to bring awareness to the importance of learning CPR and knowing how to operate an AED. "She's right here smiling at me here," Troutman said. "This is pretty incredible, it's a great feeling see."